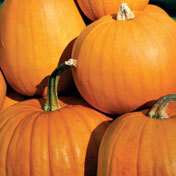 description for "Winter Squash and Pumpkins: Cucurbita pepo, 'Young's Beauty'"
Cucurbita pepo 'Young's Beauty' produces pumpkins of 8-12 pounds. Planting depth: .5-1 inch. Days to germination: 3-7 days. 95-105 days to maturity. reviews for "Winter Squash and Pumpkins: Cucurbita pepo, 'Young's Beauty'"